I don’t always seek out blended Scotches. 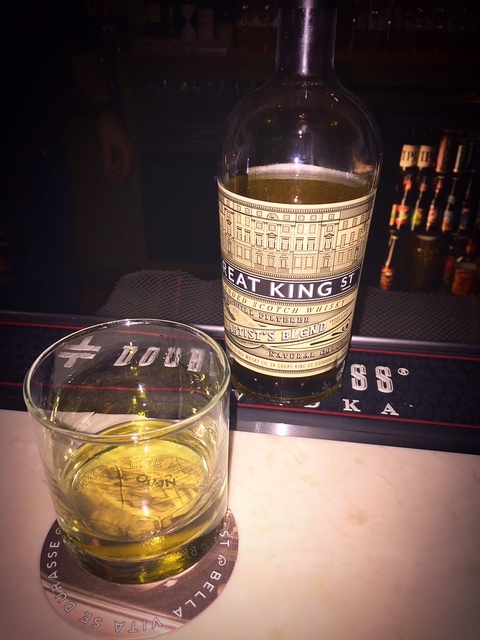 Most of the time I try a brand mainly in part to a recommendation that has been made, and that is exactly how I came to try Great King Street – Artist’s Blend Blended Scotch. After stopping by for a quick bite at Nebo restaurant in Boston the bartender (I believe her name was Julie) made a note that we were whisky drinkers and recommended we try this blend, and we off course did. Great King Street is a street in the New Town of Edinburgh. It is also the street where the registered office of Compass Box Whisky Co. is located at and they are the ones behind the creation of this new blended Scotch line. John Glaser started the company in 2000. Each blend typically has three to four whiskies from different distilleries. The low number of whiskies blended allows for the characteristic of each whisky to come out in each blend. Now I can’t speak for their entire blended whisky line, but I can tell you that it definitely works for the Artist’s blend. I think this whisky is beautifully made. I very much enjoy this whisky and would recommend trying. It is a very well blended whisky that is balanced and tasty. The four whiskies used for the blend harmoniously come together to form a perfect marriage. What’s also fantastic about this whisky is the fact that it is priced around $40 a bottle. You get a great tasty blended Scotch for a very low cost and to me that is a win win. A lovely blend indeed. I got to sample Great King Street, among other lovely CB expressions, the first time I met Glaser. I definitely recommend seeking out more of their range, which you probably already have on your radar. I will definitely seek out others in their range. Glad to hear that they are as great as this one. Thank you!